Vote Yes | Article 56 | Delta-Montrose Electric Assn. Click here to download the proposed amended and restated DMEA Articles of Incorporation. Click here to read the Example Notice and Information Statement to be sent to members. What are DMEA’s Articles of Incorporation? The Articles of Incorporation are the document that created Delta-Montrose Electric Association back in 1938.
Who has the power to change the Articles of Incorporation? DMEA’s members do. In May 2018, the DMEA Board recommended “amending and restating” (revising) the Articles. The Board recommends revisions, but you the members vote whether to adopt them. What will this proposed amendment will do? The revisions do three general things. First, they modernize and streamline language (which in some cases been in place since 1938). Second, they allow DMEA to take advantage of being governed by a newer Colorado cooperative law (called the Colorado Cooperative Act). Third, they give DMEA more financial flexibility by allowing it to issue capital stock to non-members. You will receive more details with the official notice and ballot around late September. Please keep an eye out for that in the mail. Will all members be able to vote? Yes. Ballots will be mailed to all eligible members (as defined in our bylaws) on September 21. You can expect to receive yours the last week of September. To vote by mail, return ballots must be received by October 12. Can I drop off my ballot in person? Yes. Members will be able to drop off ballots between 8 a.m. and 10 a.m. on October 16, 2018 at DMEA headquarters, 11925 6300 Road, Montrose. Members can also vote in person at 10 a.m. at the special meeting on October 16 at DMEA Headquarters. Have the Articles of Incorporation been changed before? Yes. DMEA’s members have voted to amend the Articles of Incorporation several times. These proposed revisions keep many amendments adopted by our membership over time. This includes director term limits, liability limits, and the ability to have wholly owned non-electric subsidiaries like Elevate. Why is DMEA proposing changes to the Articles of Incorporation? DMEA celebrated its 80th birthday this July. The primary purpose of revising DMEA’s Articles is to position DMEA for its next 80 years and to make sure we remain competitive, reliable, and cost-effective.This includes things like modernizing DMEA’s financing options so that we can consider additional investments, power supply alternatives, and more local generation. Are the proposed changes related to Tri-State? Yes, some of the key changes relate to DMEA’s wholesale power supplier, Tri-State. DMEA’s board and management have looked to address Tri-State’s increasing costs. One option we’re considering is buying out of the Tri-State contract. The proposed DMEA Articles of Incorporation would give DMEA financial flexibility to, for example, raise money by issuing capital stock to non-member investors to help DMEA leave Tri-State. Can DMEA really buy power from other suppliers at rates low enough to justify this change and cover the cost of a buyout? We believe DMEA can buy power from somewhere else for much less than Tri-State. This savings should allow us to cover the cost of our Tri-State buyout, the costs of other services that Tri-State currently provides, and hopefully stabilize rates in the long run. Are allof the changes related to Tri-State? No. The proposed Articles modernize and streamline language existing since 1938. The Articles would also have DMEA take advantage of being governed by a Colorado law called the Colorado Cooperative Act. That law was passed to provide greater direction and flexibility to cooperatives like DMEA. The Colorado Cooperative Act gives flexibility in financing, but it’s also a more comprehensive law giving DMEA guidance in its operations. Why does DMEA want to be able to issue capital stock? Businesses need capital (money) to operate and DMEA is no different. DMEA needs the option to modernize its capital structure to pursue our membership’s most significant goals and interests—like finding power supply alternatives to Tri-State—while keeping our rates stable. Currently DMEA can raise capital by raising electric rates (member equity) or through cooperative loans (debt). Issuing non-member capital stock just adds another tool to the financial toolbox. Does DMEA need to make this change and issue capital stock because of Elevate? No. While the proposed Articles let DMEA issue stock to fund various projects, the current driver for this change is buying out of Tri-State (if both sides can agree on a fair price). Who could DMEA be issuing this capital stock to? Right now, the Board intends to issue capital stock to a limited group of investors who understand DMEA and its needs. The new Articles give the Board of Directors authority to set the terms of any stock offering. However, they require that any stock issued be non-voting stock. DMEA members will still control the cooperative and keep the voting rights. Why would DMEA issue stock instead of just getting another loan? We currently get funding two ways: raising electric rates (member equity) or through cooperative loans (debt). Issuing stock as a third funding source offers flexibility and diversity. On financial statements, loans are classified as liabilities. However stock is classified as equity. This difference matters for DMEA’s finances and therefore our member rates. Can DMEA members or employees buy shares of the stock? The purpose of this stock is to raise significant capital for DMEA. Right now, the Board intends to issue the stock to a limited number of investors on terms the Board will set. Don’t forget that as a member-owner you already have an equity interest in DMEA. Plus you have voting rights! When will DMEA be issuing this capital stock? DMEA will only issue stock when the Board decides that it is in our members’ long-term interests. The Board could also determine not to issue any stock at this time. How will these amendments affect the co-op model? Will this mean that DMEA will become an investor-owned utility? No. DMEA will remain a rural electric cooperative—your cooperative—and we will not change to an investor-owned utility. Will DMEA still be a cooperative? YES! DMEA will remain a member-owned cooperative. Are the members giving up control by supporting this? The proposed Articles require that any stock issued be non-voting. Ultimate control of the cooperative remains, as always, with our voting members. Have other co-ops done this before? If this is a good idea, why haven’t other electric cooperatives done it? DMEA is not a typical electric cooperative. We are trendsetters. We are ahead of our industry in many ways: building fiber across our entire service territory, being the first Tri-State member co-op to reach the 5% threshold on generation, showing support for renewable generation through our recent efforts with FERC, and the list goes on. Our members encourage our pioneering spirit. Issuing stock to non-member investors is another way DMEA is in tune with available opportunities and looks for unique solutions to best serve our members. When and how can I vote? Ballots will be mailed to all eligible members on September 21. You can expect to receive yours the last week of September. To vote by mail, return ballots must be received by October 12. Members may also drop off ballots between 8 a.m. and 10 a.m. on October 16, 2018 at DMEA headquarters, 11925 6300 Road, Montrose, or may vote in person at 10 a.m. at the special meeting on October 16 at the DMEA Headquarters. What happens if I don’t vote for this? If a majority of the members voting do not support these recommended revisions, our Articles of Incorporation will remain the same as they are today. This will limit our ability to raise non-debt funding and could have a negative effect on our ability to fund certain initiatives (like power supply options). Does the DMEA Board have a position on this vote? Yes. The DMEA Board believes this initiative is in the best long-term interests of our members and asks you to vote YES. Look for the official notice and information materials in September, which will be included along with your voting ballot. 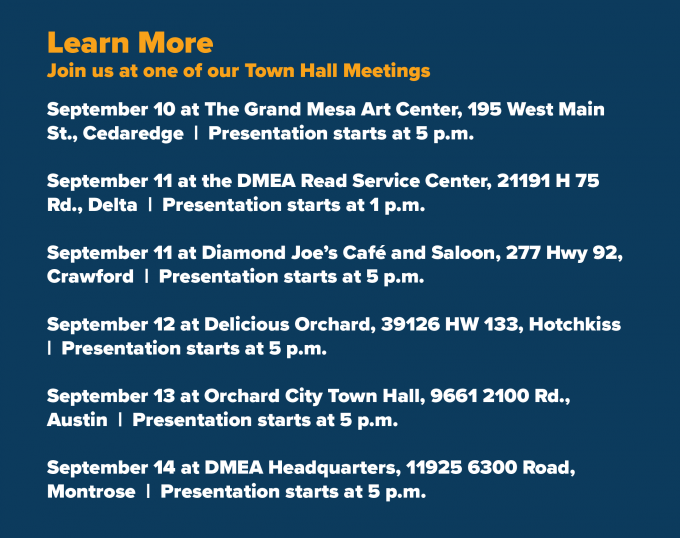 Please also consider attending our town halls. If you have any questions, please send an email at VoteYes@dmea.com. Thanks for supporting YOUR local cooperative!